I grew up with three younger sisters and, as anyone with a sister can relate, there have been times I’ve literally wanted to kill them while there have been other moments I’ve never experienced greater friendship or love. My mom used to joke that life with four girls was no “Little Women,” but, if you’ve read your Louisa May Alcott, you know things weren’t always rosy in the March household either. Remember when Amy burned Jo’s manuscript after being excluded from a night at the opera? Been there. In my case, my sister Allison took my diary to school and shared it with my fourth-grade crush, making sure to point out the parts that pertained to him. It was all my mom could do to keep me from ripping out all of her hair. Fictional or real, the bipolarity of the relationships between sisters is unlike any other. My girls are only 3 and 4, and it seems one minute they’re the best of friends and the next they’re giving each other facial abrasions. With an older sister of her own, author Rukhsana Khan appears to know a thing or two about these tumultuous relationships. And her highly acclaimed children’s book, “Big Red Lollipop,” proves it’s a cross-cultural phenomenon. 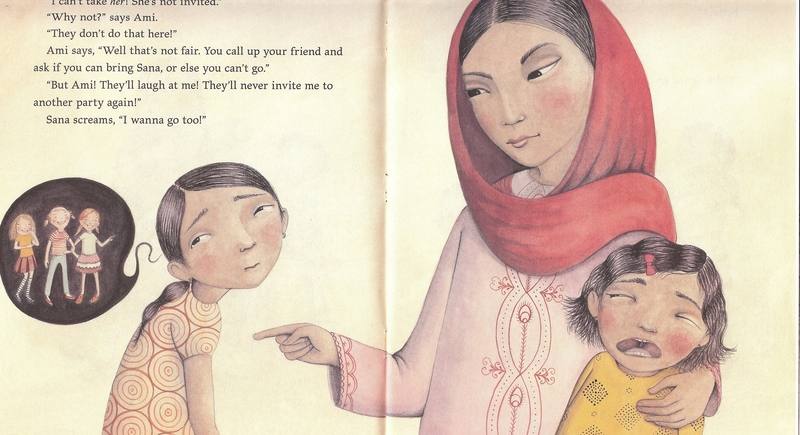 Although praised for the insight it offers on the experiences of immigrant children, it’s the perfection with which Khan has painted the sister dynamic that I find most fascinating. 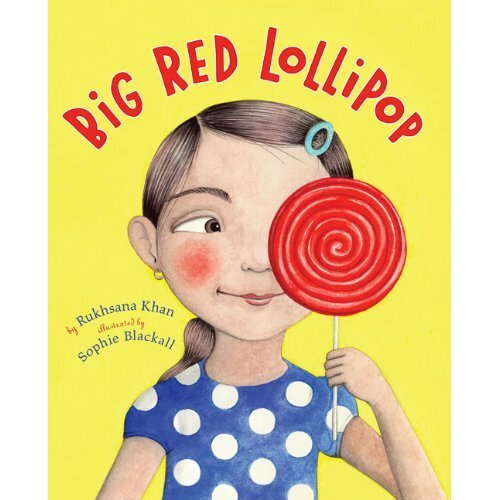 “Big Red Lollipop” chronicles the challenges its protagonist, Rubina, faces when she’s invited to her first-ever birthday party, a concept that’s apparently foreign to her mother, called “Ami” in the Pakistani language, Urdu. Rubina’s younger sister, Sana, takes advantage of her mother’s lack of familiarity with birthday-party etiquette and insists that she being allowed to attend the soiree, as well. 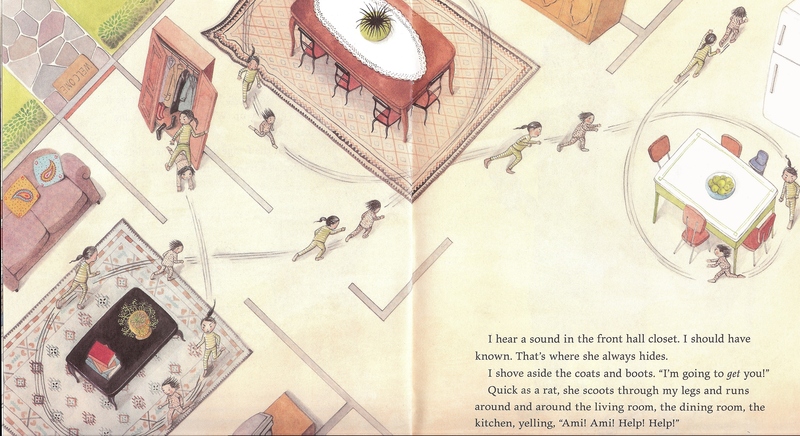 And by “insists,” I mean she screams and cries until she gets her way, and the pitiful production is perfectly rendered by illustrator Sophie Blackall, who has caught Sana mid-cry, peaking out of the corner of her eye to ensure her antics have achieved their desired effect. Not only is Rubina forced to endure the embarrassment of asking for another invitation, but, once at the party, Rubina is also further mortified by Sana’s temper tantrums. The only silver lining to the disastrous event? The party favor bag containing a giant red lollipop, among other treasures. Sana impulsively polishes off all of her goodies, but Rubina plans to savor her lollipop and hides it in the refrigerator overnight. When she goes to retrieve her treat the next day, however, she finds that someone has beaten her to it. A dramatic chase scene ensures, and the accompanying illustration, with its bird’s-eye view, is by far my favorite visual element of the book. I could offer a very similar representation of how I reacted when my sister (Allison, again) poured pop over my head one summer afternoon while we were playing outside. My route of pursuit took several loops around the trampoline, crossed the street and traversed through a half dozen backyards before I finally got ahold of her. Fortunately for Sana, their mother was on hand to intercede. My sister was not as lucky. As is often the plight of the oldest sibling, Rubina’s mother reprimands her for threatening her younger sister and failing to share her treat. Sana, the true transgressor, escapes without punishment. Oh, the injustice! My oldest-sister heart aches with empathy! Not only is Rubina out a lollipop, but she soon finds she’s also been shunned by her peers at school as a result of the embarrassing birthday-party episode. The sad acceptance Blackall has drawn on Rubina’s face is heartbreaking. But the story takes an interesting twist as it reaches its conclusion. 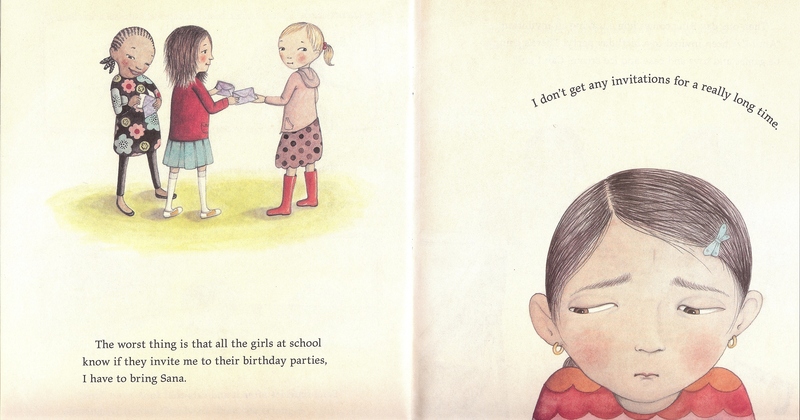 Time passes and Sana is the one running home in excitement with her first invitation to a birthday party. Now it’s Maryam, the youngest of the three sisters, who screams to be taken along. Their mother is nothing if not consistent, and she’s prepared to impose the same demands on Sana that she did Rubina. Although the thought of retribution is tantalizing, Rubina demonstrates a greater virtuousness than I would have ever been able to muster. So Sana gets to go by herself. Rubina’s benevolence does not going unnoticed. Although she’s unable to erase the past, Sana returns home from her party with a peace offering. The happy ending isn’t just a tidy product of fiction. 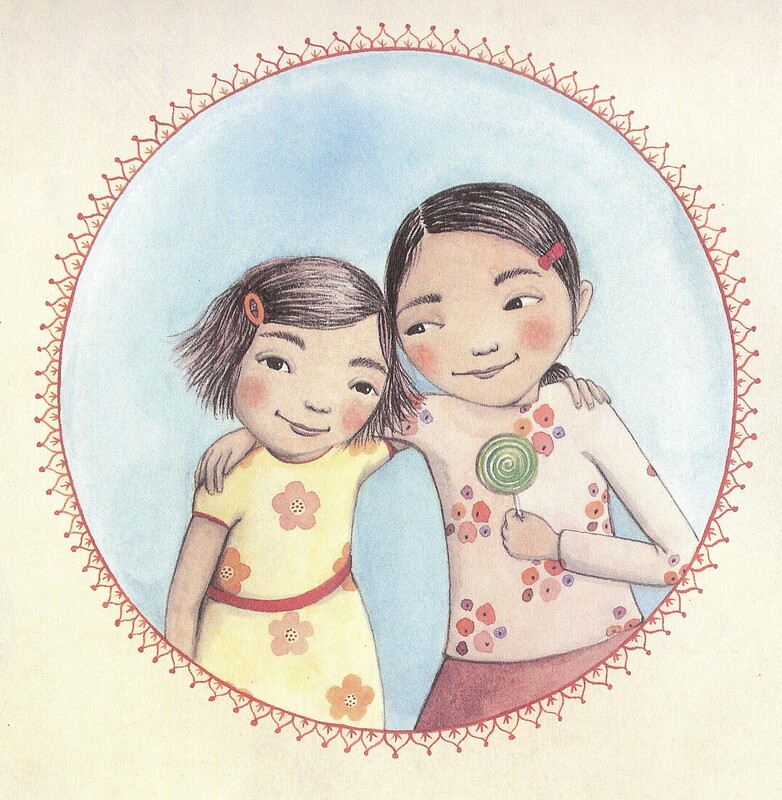 Dedicated to her older sister, Bushra, Khan reveals the book is nearly 100 percent autobiographical. Khan was born in Lahore, Pakistan, but immigrated with her family to Britain and, later, Canada when she was just three. The honesty and accuracy of the story, paired with Blackall’s unbelievably expressive illustrations, made it one of the most recognized and awarded children’s books of 2010. Since discovering it through the wonders of the Scholastic Book Clubs earlier this spring, it has become one of my favorite children’s books of all time. As an oldest child, I feel validated by Rubina’s story. I’ve always argued that oldest children carry the burden of paving the way for their younger siblings, oftentimes enduring less-than-fair judgments from their parents. I’ve sworn that, as a parent myself, I would make sure I had a “black book” of punishments to ensure whatever was imposed on the first child was recorded and also handed down to subsequent children. But Khan’s story illustrates that parents sometimes make mistakes the first time around and correct themselves as they learn. I suppose I should probably forgive my parents for lightening up on my younger sisters, even if it was intolerable for me. “Big Red Lollipop” also has reminded me that sisters will inevitably go through long phases, not just moments, of love and hatred, but it will hopefully be their friendship that stands the test of time. For Rubina and Sana (and the real-life Bushra and Rukhsana) reconciliation came only after a period of maturation on Sana’s part and after enough time had passed for forgiveness to work its way into Rubina’s heart. In my case, my sister Allison and I have a history of fights too long to chronicle, and we endured a period of time in college when I wouldn’t speak to her for months on end, but there’s no one I’d rather spend time with today. I’m confident the same will hold true for my daughters, though they’ll likely weather many storms in the years ahead. This morning they were pulling each other’s hair, but by midday they were asking to wear their best friend necklaces.